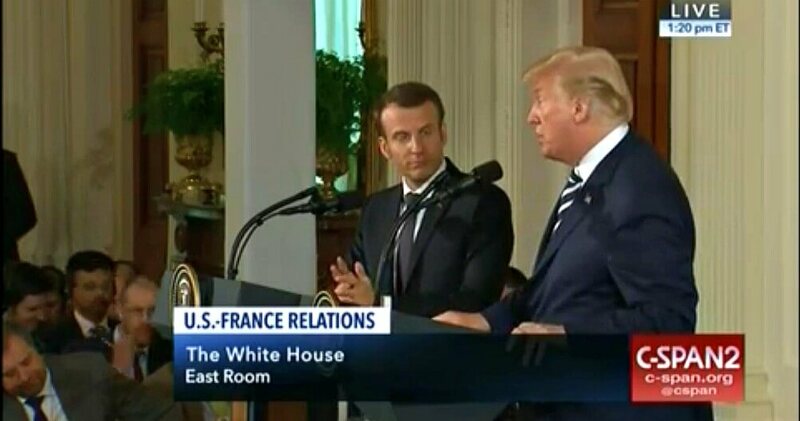 President Trump has been spending time with French President, Emmanuel Macron this week and on Tuesday they held a joint press conference to explain some of what they have been discussing. Macron made it clear that he was hoping that the President would keep the USA involved in the Iran Deal, but also that he was pushing to see the deal expanded to include the ongoing turmoil in Syria. Hard words from a serious man. If I might add… the countries that are in the area, some of which are immensely wealthy, would not be there except for the United States and to a lesser extent, France. But they wouldn’t be there except for the United States. They were not last a week. We are protecting them, and they have to now step up and pay for what is happening. I don’t think France or the United States should be liable for the tremendous cost. The United States is embarrassingly into the Middle East. As of a few months ago, as you heard me say before, and I don’t think responsibility but I would be very embarrassed if I had to, $7 trillion. And when we want to rebuild our infrastructure, everyone says we want to be careful with our money. When we want to fix a highway or build schools and lots of other things, tunnels and bridges, they say no, let’s be careful with our money. And yet we have spent $7 trillion in the Middle East, and we have got nothing for it. Nothing. Less than nothing as far as I’m concerned. That is over an 18 year period. The countries that are there, that you know all very well, are immensely wealthy and they will have to pay for this. I think the president and I agree very much on that, and they will. They will pay for it. We have spoken to them and they will pay for it. There is a chance, and no one knows what I am going to do on the 12th, although you, Mr. President, have a good idea, but we’ll see. We shall see. We will see, if I do what some people expect, whether or not it will be possible to do a new deal with solid foundations because this is a deal with decayed foundations, it’s a bad deal. It’s a bad structure. It is falling down. It should never ever been made. I blame Congress and a lot of people for it. It should never have been made. We will see what happens on the 12th. I will say, if Iran threatens us in any way they will pay a price like few countries have ever paid. Okay.